Mrs. Eric Loder (Miss Gabrielle Ray) leaving the Law Courts. No one could have blamed a Divorce Court Judge for becoming a hopeless cynic, as yesterday it was story after story of shattered ideals and of hopes which were unfulfilled. Many well-known people – including two Gaiety actresses – figured in the cases. 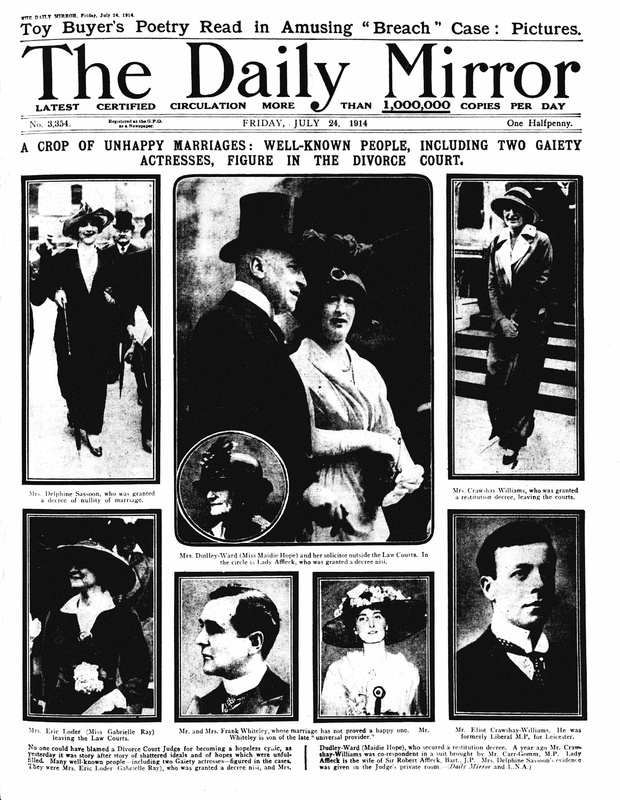 They were Mrs. Eric Loder (Gabrielle Ray), who was granted a decree nisi, and Mrs.Dudley-Ward (Maidie Hope), who secured a restitution decree. A year ago Mr. Crawshay-Williams was co-respondent in a suit brought by Mr. Carr-Gomm, M.P Lady Affleck is the wife of Sir Robert Affleck, Bart., J.P. Mrs. Delphine Sassoon’s evidence was given in the Judge’s private room.